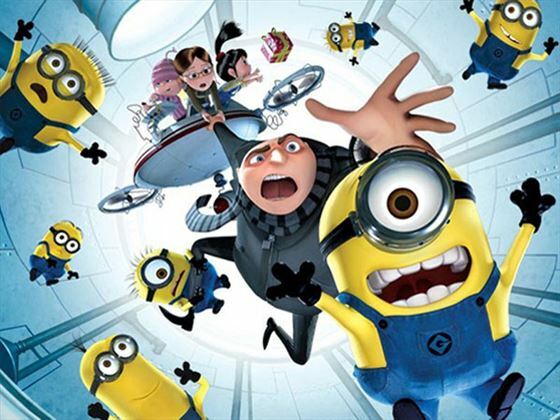 Jump into the heart of the action of your favourite movies at Universal Studios Florida®, featuring attractions such as Despicable Me Minion Mayhem, Shrek 4-D, Revenge of the Mummy® and The Simpsons Ride™. As the world’s premier movie and TV based theme park, you’ll find an incredible array of rides, shows, movie sets and attractions. 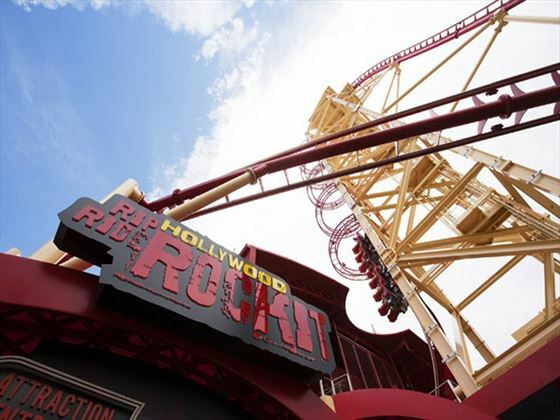 Plus, it’s the only place where you can rock out on the Hollywood Rip Ride Rockit®, the only rollercoaster where YOU pick the soundtrack to your ride! Thrill seekers will love the new TRANSFORMERS: The Ride-3D, that blurs the line between fiction and reality, as high-definition 3D film fuses with flight simulation technology to redefine thrill rides. You can also get competitive with your friends and family on MEN IN BLACK™ Alien Attack™, that will have you zapping aliens on a Men In Black training mission on this interactive ride. There’s also loads for little ones in Woody Woodpecker’s KidZone®, including some all time favourite kids characters, such as E.T. Barney and Curious George. 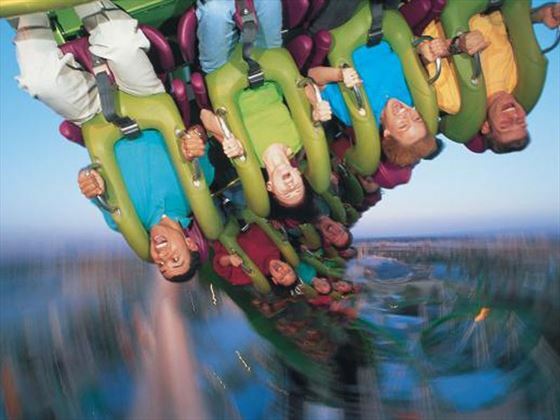 At Universal’s Islands of Adventure you’ll feel the amazing adrenaline rush of cutting edge rides and attractions that will challenge all of your senses. 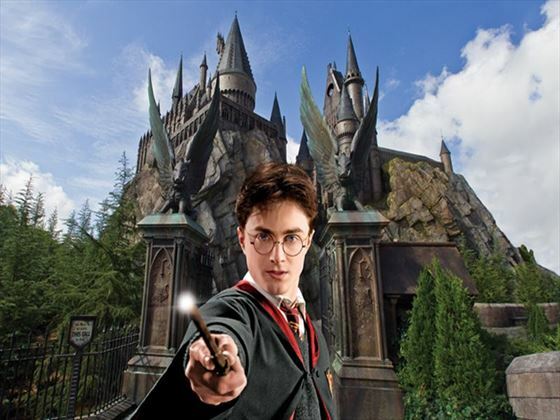 Immerse yourself in the amazing Hogwarts and Hogsmeade at the incredible Wizarding World of Harry Potter™, just one of five fantastic themed islands at this incredible park. 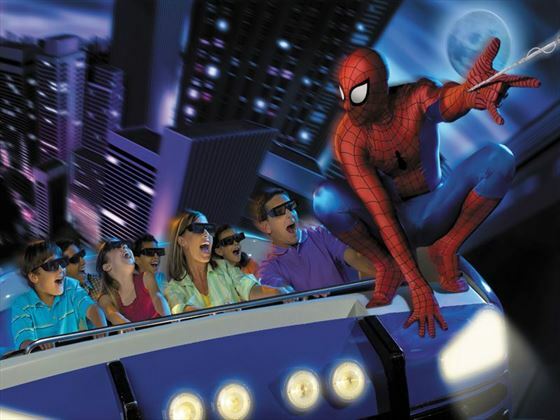 At Marvel Super Hero Island® your favourite comic book characters come to life on rides such as The Incredible Hulk Coaster®, The Amazing Adventures of Spider-Man® and Doctor Doom’s Fearfall®. Get a soaking at the Toon Lagoon®, with Dudley Do-Right’s Ripsaw Falls® and Popeye & Bluto’s Bilge-Rat Barges® drenching all who climb aboard! 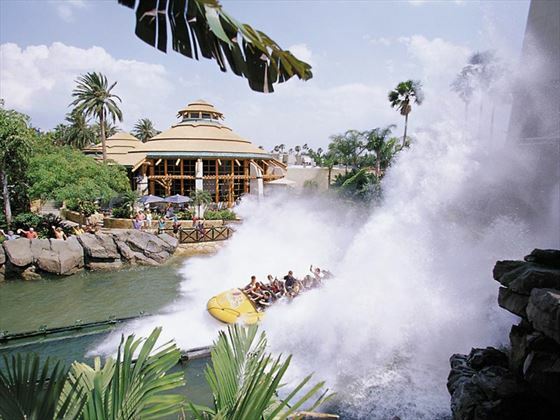 The water fun continues in the Jurassic Park area, with the enormous drop of the Jurassic Park® River Adventure, where an 85 foot plunge awaits! Kids will love the Seuss Landing™ area, with a range of rides perfect for younger theme-park goers, whilst The Lost Continent® will engage you in a land of ancient myths and epic legends. Outside of the parks, the whole family will find something to do at the incredible Universal CityWalk®. This 30-acre entertainment complex is the hottest spot for entertainment and dining in Orlando. Experience the very best in live music, fine and casual dining, dancing, shopping, movies and a whole lot more. 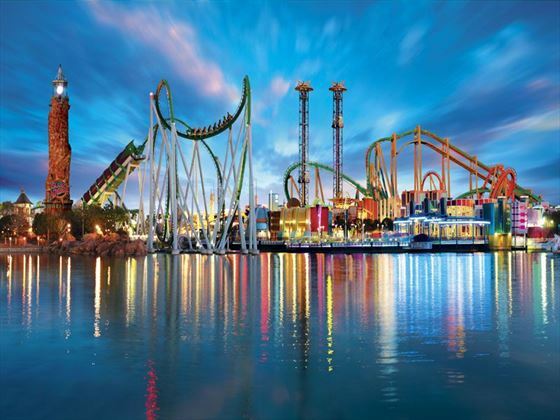 Whether it’s a night of family fun, or a place to hang out with friends, Universal CityWalk truly is the hottest venue in Orlando! Universal's third park, Volcano Bay is set to open it's doors 25th May 2017. A water themed park with a difference. Experience the Waturi way of life and the perfect combination of thrills and relaxation. Collect your Tapu Tapu interactive wrist band on arrival and explore all the features it has to offer. With virtual queing and Tap Tu play areas, Volcano Bay is not to be missed. TM & © 2015 Marvel & Subs. Jurassic Park ® Universal Studios/Amblin. All Popeye characters TM & © 2013 KFS, Inc. TM Hearst Holdings, Inc. Shrek 4-D © 2013 DreamWorks Animation L.L.C. 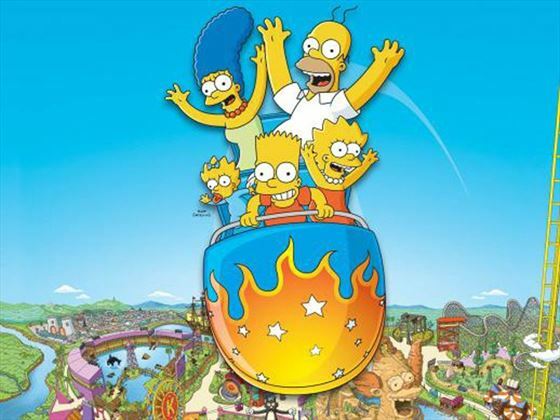 THE SIMPSONS RIDE TM Twentieth Century Fox Film Corporation. The Simpsons TM & © 2013 Twentieth Century Fox Film Corporation. All rights reserved. Men In Black & Alien Attack: TM & © 2015 Columbia Pictures Industries, Inc. All rights reserved. T2, Terminator ® StudioCanal S.A. ALL RIGHTS RESERVED. Universal elements and all related indicia TM & © 2015 Universal Studios. All rights reserved.